If you are new to ThermoFun – Cook Alongs have been thoroughly enjoyed by thousands for 4 years now! Each one with approximately 12-14 recipes consisting of a full Main Meal Menu for a week, Shopping List, Challenges and Giveaways ALONG with utilising ALL of the Thermomix. You can rest assured that if you’re a beginner it’s perfect, if you’re a seasoned veteran perfect, or haven’t used your machine in a little while, perfect! If you are not a ThermoFun Club member yet, I’d suggest you sign up today! 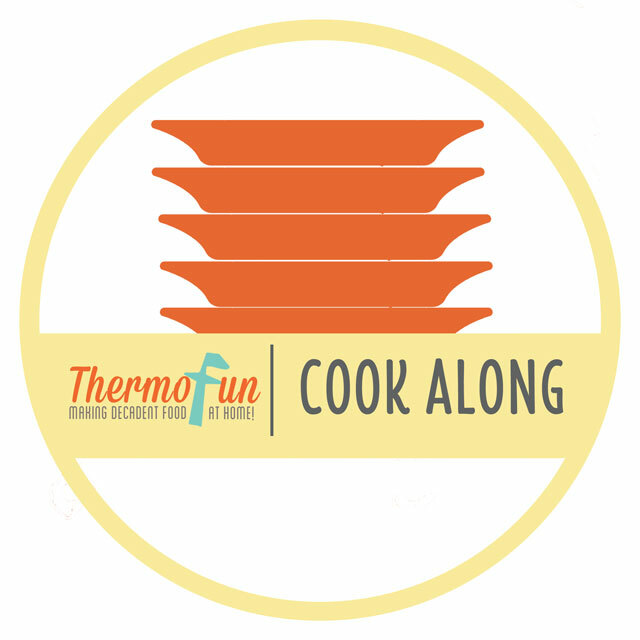 Cook Alongs are FREE for ThermoFun Club Members, and $7 per cook along for non-members. For further information on ThermoFun Club Membership details Click Here. What do you get for $7? Challenges & giveaways during the week. Your menu & shopping list are yours to keep so you can have easy weeks every now and again. Access to our ThermoFunkies Cook Along Facebook group. We don’t have specific dietary meals. It is a broad range of recipes. A couple of days before we start, you will receive via email, your weekly menu and shopping list so that you can be prepared. Make sure you join the ThermoFun Cook Along Facebook Group where you’ll be able to ask questions about the recipes and participate in the week long giveaways. The weeks main meals are diverse in type and are easily adaptable for those that are vegetarian, paleo, gluten free etc. You will have access to ThermoFun (Leonie) via a closed Facebook Group for any help if needed on any of the recipes. As each of the recipes will have their own post. There will be a number of challenges during the week with amazing prizes. So make sure you’re in with a chance. To enter you will need to post a photo of your meal to the closed Cook Along Facebook group or email ThermoFun if you’re not on Facebook. Not only do we have the amazing giveaways, but there will be opportunities all week to win other prizes. You will need to be in the Facebook group for those ones. This was a great way to spice up my cooking regime. I just picked a few that suited us to compliment some of my old faithfuls. Kids loved trying and rating new dishes. It is a great idea. You do an amazing job putting this together Leonie and I am glad you are changing the last one for the year, if I wasn’t a member I would happily pay to join in, I hope others see the value and join up too. There can be a lot of negativity in some FB groups and people can get caught up with this, your page & group are always positive and fun and a great place to ‘hang out’!! Thanks again, from one chocaholic to another. The cook alongs are amazing. Even though I didn’t enter or post pictures I was glad of the ones who did. I made lots of the recipes and found that all were easy enough to follow. Well done ThermoFun. I love the cook alongs. It provides me with guided challenges that I otherwise wouldn’t have tried or even thought could be possible in the thermo. I don’t have facebook, nothing against Thermofun, just don’t like the whole social media as I see the down side of it in my professional work. But I loved the recipes, I made quite a few in this months Cook Along, but didn’t get to send photo’s. The condensed milk was a real winner and fudge became very popular in my household!! Sincere thanks for the organisation that went into this. Keep it going if you can, it’s fun and for that week less stressful as I know what we are eating. I have a son who is a very fussy eater and for that week I tell him not to tell me he doesn’t like what I’m cooking as I’ve never cooked it before. His new favourite meal is beef mac & cheese. Thank you for doing this and helping thousands of people. Thanks Leonie for all your hard work and the effort you put in to make this happen. Thank you for all your effort in putting this Cook Along together, I appreciate it takes a lot of time and am grateful for the opportunity to try some new recipes and techniques. Your hard work is appreciated Leonie, I like that I can be organised for a whole week of cooking with menus, shopping list and delicious easy recipes to follow. Learning new ways to use my thermomix is a bonus too. I look forward to the Cook Alongs! Please keep running them; even if I had to pay extra, I’d still be queuing up! Thank you. Loved everything about the Cook Along. As I am relatively new to the Thermo and don’t have a consultant who bothers about me I need all the help I can get. If it wasn’t for my niece I would have put it in the cupboard so you can see how I loved everything about this experience with both you and the group. I would also like to thank you for all the hard work you put in especially for people like me and I will still try and follow what ever you post. Thank you once again. I joined late, so didn’t get to make use of many of the awesome resources available, but the recipes were awesome and very much appreciated! This was the best thing I could have done to introduce me to my Thermomix! 🙂 Thankyou so much! While the challenges were easy for me I am a confident thermomix owner, they got me thinking and trying things I had been meaning to. I didn’t do the challenges; loved the menu and shopping list. And enjoyed the kick along to using my Thermie more consistently and easily. Good variety in the recipes provided. All good. Thank you. Thanks for all your hard work, encourages me to cook different things. I loved exposure to recipes that I have not used before, especially as my thermomix is still quite new. I didn’t know I could make my own condensed milk, and now I prefer the home made version which is slightly less sweet. Great job, thank you!